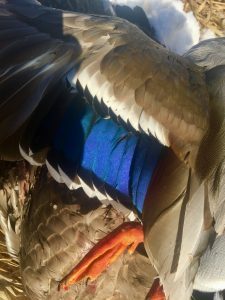 Bighorn River Fishing Report: Cast & Blast-We had a great day waterfowl hunting and fly fishing on the Bighorn River yesterday! The warmer weather (38 degrees) and sunshine were fully welcomed! The Bighorn River flows are at 1254 CFS and Boysen Reservoir is slowly emptying for spring run-off. The best time of the day for fishing the river right now is from 10 am to 3 pm when temperatures are warmest. Standard winter tailwater flies are productive right now including: annelids, midges, and sow bugs. So far boat ramps are still accessible and there is little ice on the river despite the cold temperatures the last few weeks, but caution is still advised. 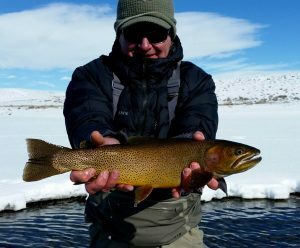 There is a considerable amount of snow in Thermopolis right now, but the fishing is good if you don’t mind a little cold weather and ice on your fly rod guides. Duck season is now closed on the Bighorn River in Thermopolis, Wyoming. We had a fun day yesterday finishing out the duck season with a few ducks and a goose. There were a lot of ducks and geese flying. It was a productive and beautiful day to hunt topped off with fishing. Nothing beats combining both hunting and fishing in one day and finding success in both! Duck hunting may be over, but there is still some time to concentrate on goose hunting until the end of the month. There seems to be plenty in the area. Reminder to drift boat anglers: Please do not forget to purchase your 2018 AIS sticker and/or get your boat inspected if you are coming from out of state. To see more information please visit the Wyoming Game and Fish AIS Program. The Game & Fish have frequent check stations on and off the river, and the fine is steep. 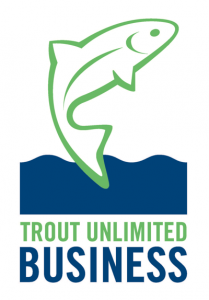 We want to keep our pristine waters free of aquatic invasive species. 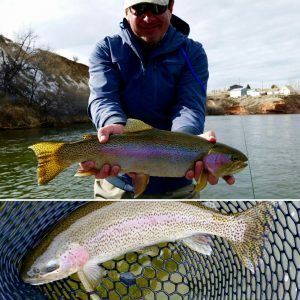 Bighorn River Fishing Report Wyoming River Flows: The Bighorn River flows are starting to bump up due to the amount of snow in the Wind River and Owl Creek Mountains. Flows have ramped up from 900 to 1525 cfs as of today. Boysen Reservoir is currently 88.8% at capacity. It is expected that the river will soon be up to 2100 cfs. Keep posted to see when the Spring Flush will be happening. It will be this month and more info coming tomorrow. 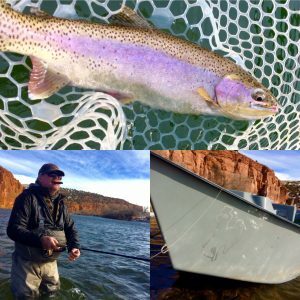 To see most current releases from Boysen Dam: Wind River and Bighorn Rivers click HERE. The Bighorn River was off color and had quite a bit of moss floating in it yesterday, but the weather, company and fishing were great. The moss and clarity will only get better as the river flows stabilize. Hot flies: annelids, sow bugs, streamers. Keep posted for Green River water flow information coming soon. It is going to be a big water year! 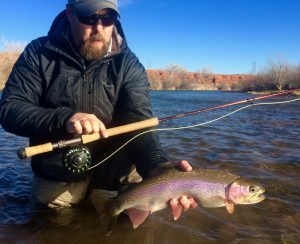 Bighorn River Fishing Report Thermopolis, Wyoming: Dunoir Fishing Adventures guides have been busy guiding on the Bighorn River this last week. The fly fishing has been absolutely outstanding and the weather has been wonderful for winter. There have been a few storms that have rolled in lately and that seems to slow the fishing down just a bit, but as soon as the temperatures come up so does the fishing. 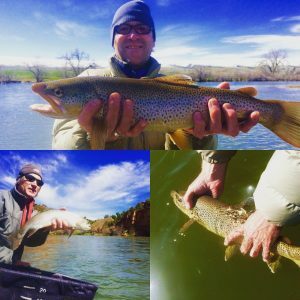 Guide Jeff Judkins had three great days out with one of our favorite guests, Ed, on the Bighorn River. The fishing was lights out each day. Ed pulled in some nice trout on annelids, midges, sow bugs, and had one great day on streamers. Always fun. 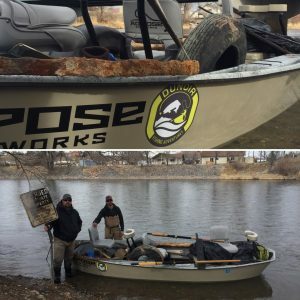 Guide, Todd Helms, helped out with Trout Unlimited Bighorn River Clean Up day and hauled in a boat load of trash. This is the first annual event that brought in several guides from the area and spearheaded out of Cody, Wyoming. We were happy to see this event come into fruition as it has been talked about a lot but never done. We appreciate all those volunteers who came to clean the Bighorn River up just in time for spring fishing. We know all people who will float and fish the Bighorn River this year will be happy to see how clean the river is right now! 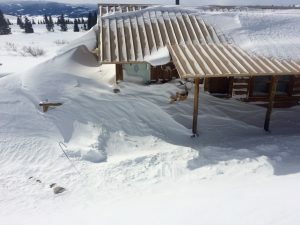 On another note, guide Jeramie Prine, snowmobiled into the headwaters of the Bighorn River (Wind and Dunoir Rivers) this weekend and there is a tremendous amount of snow in the high country. Early summer conditions will be very interesting. More on that to come in the next report. Keep posted. 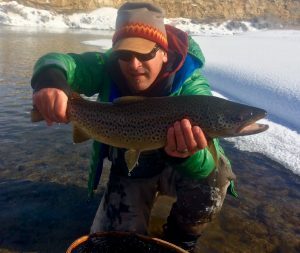 Bighorn River & Wind River Fishing Report: Last week with the sudden heating up in the weather, the Bighorn River was chocolate milk from Buffalo Creek to north of town. 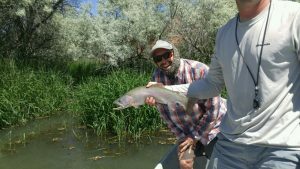 This weekend the Bighorn River cleared up and the fishing was pretty good. Standard winter, spring flies are pulling fish right now. Think annelids, sow bugs, and midge patterns. There is the occasional blue-wing olive hatching, but the big hatch has not started just yet. The Wind River below Boysen dam boat ramps are super hairy right now and the fishing is only so-so. The cold temperatures seem to be putting the fish down and has them holding in deep water. Heads up that there will be a Bighorn River Cleanup Day this Sunday, February 19, 2017. There will be lots of boats and clean up crews on the water. 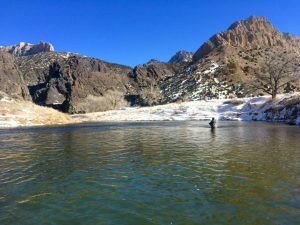 Green River Fontenelle Fishing Report: The fishing on the Green River below Fontenelle has been pretty darn good for mid-winter. Fishing has been lights out in the mornings and then slowing up in the afternoons when the air temperatures begin to drop. We had several great days over on the Green River last week with long time guest, Ed. Hot flies were: annelids, sow bugs, and midges. We definitely got luck with little to no wind and clear, sunny skies. Boat ramps are still really tricky and just plan on getting stuck a time or two. There have been lots of wade fisherman out trying to shake cabin fever. What a great place to do just that. 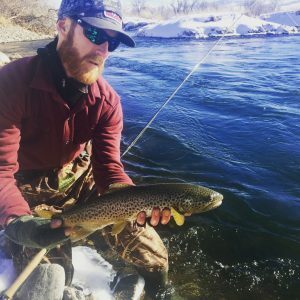 Get out and enjoy some winter Wyoming fly fishing! 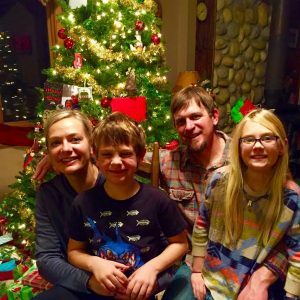 Merry Christmas from the Bighorn River, Green River, & Wind River: The Dunoir Fishing Adventures family would like to wish everyone a very Merry Christmas! 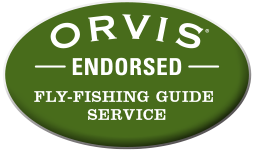 We would like to thank our friends, family, and guests for making our Wyoming fly fishing guide service what it is today. We are truly blessed! 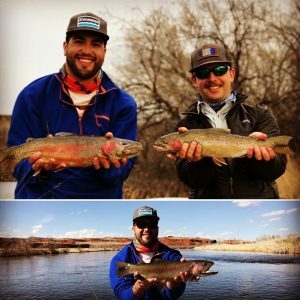 Dunoir Fishing Adventures has finally joined Instagram and we are looking forward to keeping our followers up to date on fishing conditions on the Bighorn River, Green River, and Wind River. 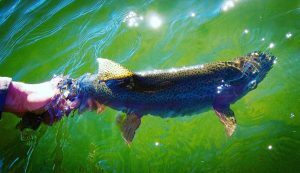 Our goal this year is to keep our fishing reports current with the latest information in Thermopolis, Dubois, Lander, and Fontenelle. We are planning on a day on the Wind River in Dubois, Wyoming tomorrow with our dear friend and legendary guide, Leon Sanderson. Nothing beats a day on the river in December. We currently have a storm making for a white Christmas. Living the dream!